Al was born in Sudbury before the Beatles became famous (so that let's you know he is old!). He was raised in Lively. He moved around the province with a previous banking job that saw him live in Timmins, Kingston, Ottawa, Sudbury (again), Cornwall, Valleyfield, Quebec, Wawa and finally Marathon. Al is the oldest of four siblings which is why many say he is so bossy. He is the proud father of a son Pierre and daughter Kayla and the proud Grandfather of Tripp and his baby sister Breea. Besides his beloved Toronto Maple Leafs, Al loves the North Shore and Greenstone Region. It's people and beauty are second to none. Al claims his favourite moment in sports was a 6th inning home run by Gary Carter of the Montreal Expos against San Diego in July 1982. His idols include Hulk Hogan and the Professor from "Gilligans' Island." 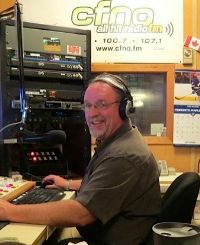 Whenever Al is not hosting his morning show or doing the news, you'll usually see him cruising around the CFNO listening area attending various functions and events. Start your weekday mornings off right with "Al in the AM". Monday thru Fridays from 6-10.